We've all been there, I think: You're on the bus to Safeway, gazing out the window into the overcast streets, and right when you start to have a nice thought about a potential ending for a blog post you notice there's a couple of wicked black birds out there, on the telephone wire. Crows, you think to yourself worriedly. But they might be Ravens. One way to tell is by how many there are. Crows, as we know, travel in little gangs called "murders", and Ravens travel in groups of two called "conspiracies" (or "unkindnesses," if you're a really big wiseass). A good rule of thumb I've been using is if there are two birds there, just assume it's a conspiracy of ravens. If that doesn't work--like if there's only one bird--try to get a look at their tailfeathers. Ravens have "wedged" tailfeathers (like, the middle tailfeather sticks out the furthest), and crows have flat tailfeathers (where the tailfeathers all stick out the same amount). This is a pretty hard thing to spot, unfortunately, so don't worry about it too much. Remember: If you're always worried about getting your birds wrong, none of your friends will respect your new hobby. Life is 4000% confidence, as my grandpa used to say. And anyway, there's one more crow/raven difference you can identify that isn't hard to spot at all: The cawing! Crows have a louder, more obnoxious caw than ravens. They sound like they're being tortured, while ravens sound like they're just being harassed. (Have a listen for yourself on the Audubon website if you want to make your own analogy.) Tight, huh? 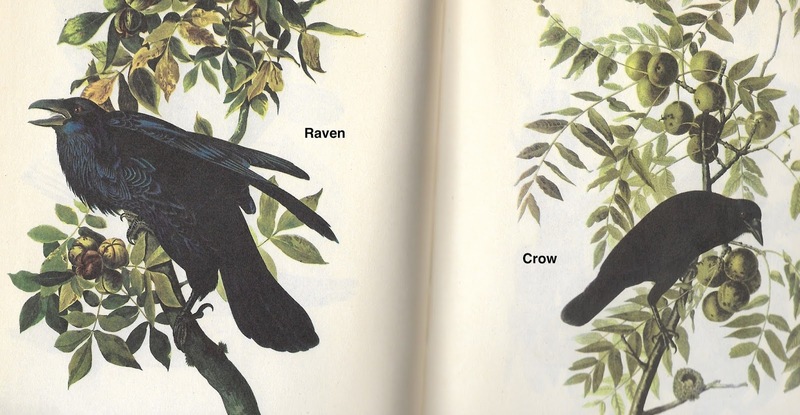 You can do most of your raven/crow differentiating without even needing binoculars. 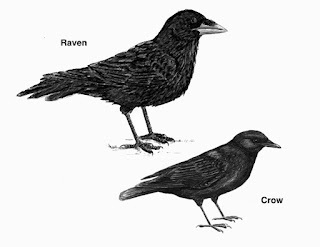 This makes raven/crow differentiation a great novice birding project. This one was stolen from an Audubon guide I bought at Vintage Books in Vancouver. 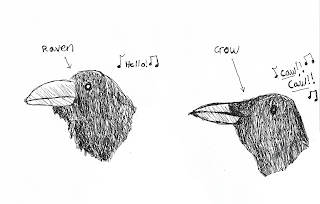 As you can see, crows are a little more bold looking, and this is an accurate representation of their personalities, too. In public, they like to "put themselves out there" and wear everyone down with their annoying-kid-at-the-dollar-store begging technique until someone gives up and buys them a trinket. Ravens, on the other hand, would rather trick you into giving them trinkets, so they can feel smarter. They'll have one raven distract you, and while you're trying to wrestle its trinket out of its mouth the other raven will swoop in and steal a trinket of yours. Talk about conspiracy and unkindness! That's why I like crows more. It's better to be up front with people.